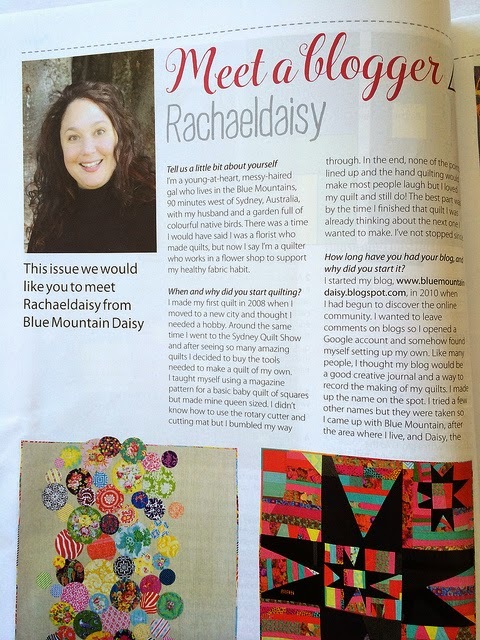 I'm the Featured Blogger in the current edition of Down Under Quilts. How cool is that? It's a 3 page spread with answers to all sorts of questions about blogging, surrounded by photos of my quilts. I'm really pleased about the focus on my blogging because I do make an effort to make my blog a friendly place to visit, with nice photos, and things to make you smile, and a bit of inspiration here and there. Watch out for the magazine in newsagents. The edition is all about Christmas and there are a variety of holiday projects. As a bonus it also comes with a handy 6 inch square ruler. A big hello and welcome to anyone who has found their way here after reading the article. I always say one of the best things about blogging is the friends you make. Kelly from Pinkadot Quilts is one of my oldest blogging friends. We found each other about 4 years ago and we've followed each others sewing adventures since then. She surprised me recently with this package of goodies. I know your eyes went straight to the chocolate bar, but check out the contents of the cute pouch. 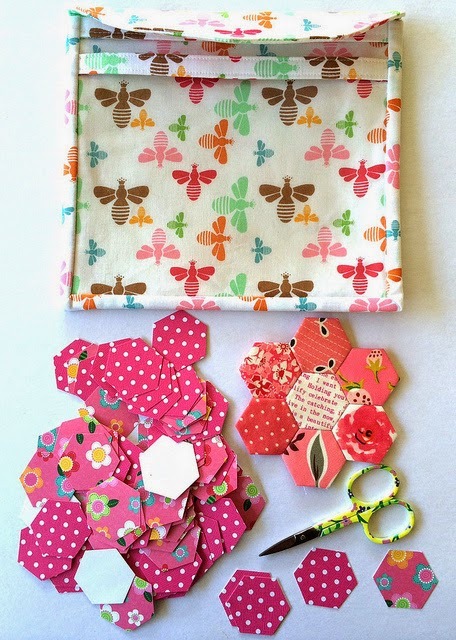 It's a Hexagon Sewing Kit, complete with pretty hexagon papers, cute scissors, and a pink hexie flower to start me off. I'm not sure if it was intentional but I like the way the center of the hexie flower has the word "celebrate". 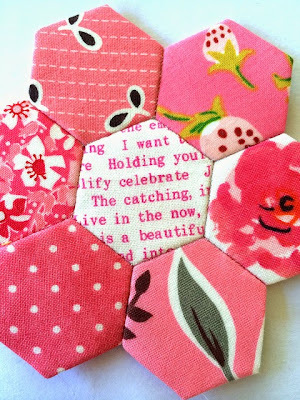 What better way to celebrate such a fun gift than to make more hexagon flowers. I haven't had much time for sewing recently. My main endeavour has been painting my sewing room. The room has had 3 coats of white paint now and is a lot brighter and lighter than the 'Before' photo I showed a few posts ago. It's like a blank canvas waiting for lots of colour to be added. I can hardly wait for the weekend when I can start moving my furniture and fabric in. Hopefully it wont be too long until I'm properly settled in and ready for sewing. 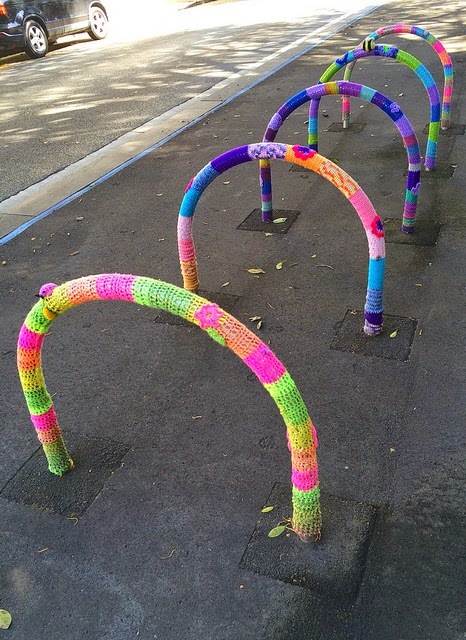 I always like to end with some colour so here are some yarn-bombed bicycle racks I saw on my way to work. Colourful woolly stripes dotted dotted with flowers. And there's even a bee! Seeing things like this just makes my day!! I hope it's added some colour to yours. Congrats on the article Rachel. I haven't seen the mag in the shops yet, so will have to keep my eyes open for it. Your blog is always a pleasure to read ... lots of inspiration! Congratulations on being featured! So many things to be excited about! An article, a surprise in the post and a new sewing room! Your new room looks great. I'm sure you will make it bright and colourful when you move in. Bet you can't wait. Congratulations Rachael....I'm going to have to go and get myself a copy of this mag...how cool! I love your posadas they are always so full of colour just like I imagine your sewing space will be! Please remember us, now that you are famous!!! Congratulations and you so.... deserve the recognition of the magazine and the wonderful new room! Kelly is awesome blogger and so glad to have found both of you! Congratulations Rachael....I'm so proud of and for you !!! I wish I could find that magazine here...I may have to go on line ! Your sewing room is looking spectacular and I like to see your progress photos ! And Kelly's gift was pretty awesome too....very sweet. I am so excited for you, your quilts are always so happy and colorful. Your new room will be so cool and I expect many more interesting quilts will be coming our way! Enjoy your gift my friend! How exciting to be featured in a magazine. I'll look for a copy of Quilts Down Under when I am at the news agent! Congratulations! Congratulations on your feature! How exiting. oh I so wish we could get it here in the US. I'll have to do some digging. What an absolutely lovely gift from Kelly. she is so thoughtful and i love the pouch. What a fun public art appearance I love that too! Your sewing space looks so fresh and bright! woo hoo that is going to be great for creating new projects! I love to read your wonderful blog! Kelly's gift is fantastic... that's so sweet of Kelly! Congrats! A very-much deserved recognition for you! 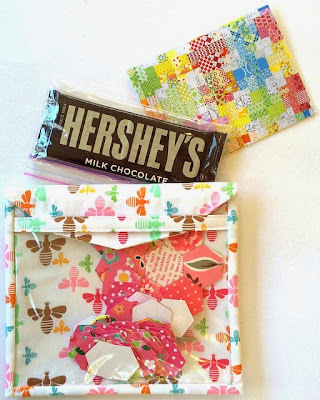 I love the hexi-sewing pouch! What a darling gift idea. Congratulations on your magazine feature! It looks like a fun article -- and a beautiful picture of you! Love those yarn bombed bike racks!!! The magazine couldn't have picked a better blogger to feature. Congrats. Congratulations on the article AND on your new sewing studio! Very exciting on both accounts. The magazine was very smart to feature talented you and your upbeat blog. YOU are very smart to make yourself a wonderful creative space in your home. Have fun setting it up!! So happy for you! Your blog is one I never get behind on. Glad it is getting the exposure it deserves. Such a thrill to see your name in print, congratulations! OOh how exciting! I do hope I can find a copy of the magazine here. I would love to read every word. Looking forward to seeing your new sewing room come together too, that will be so fun for you! Congratulations on both! Well deserved recognition. You always treat your blog as a visual color , and funfilled space. It gives us wonderful inspiration. 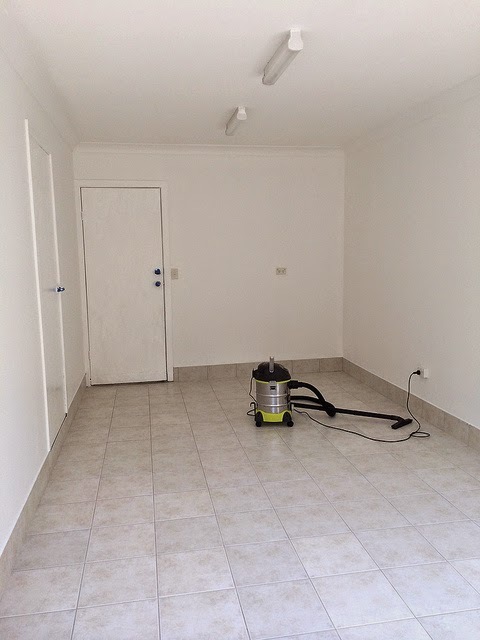 The studio is a blank canvas waiting for your special touch. Wowee! Congrats on the article! Love your received gift too...so cute . Kelly knows you well! magazine. If I lived in Australia I'd pick up a copy for sure! Love the bike racks too! Now you know that so called friend of yours is just trying to infect you with EPP, this is a very contagious condition that has been known to cause hoarditis of smaller and smaller pieces of fabric, that lady knows exactly what she has done, I am surprised this package wasn't sniffed out by border control. Have we trained dogs to sniff out small hexagon shaped items? Sure we were all distracted by the chocolate, but my dear blogging friend I am afraid she has set you on a path that ........well I and many others are on that path so let's party.....bring your chocolate! Congratulations! Next thing you'll be putting,projects in the mags. Sewing room looks great. It'll be so good to have lots of room and light to work. Congratulations Rachael! your work has such a broad appeal and it is a lovely blog! Rachael, What an exciting news! Congratulations. I am always inspired by your blog. The thoughts you put into creating beautiful setting and picking the locations for them, everything takes time. You do it over and over again. That's a very thoughtful gift from Kelly. Enjoy setting up the sewing room. It is always fun to plan new space. Congratulations Rachel, thats exciting news. I cant wait to read the article when I pick up my copy of the magazine. I love that Hedy flower, I'm dying to get into another EPP project, and thats got me enthused..
Big congrats! Your blog is one of the best in my book. :) Love your style! You are published -- again! And this time with your photo & one (of my many) favorite quilts of yours! Kelly is awesome, met her through your blog. Such a small world. Hexie On! what a treat that is going to be when it is FULL of colour! 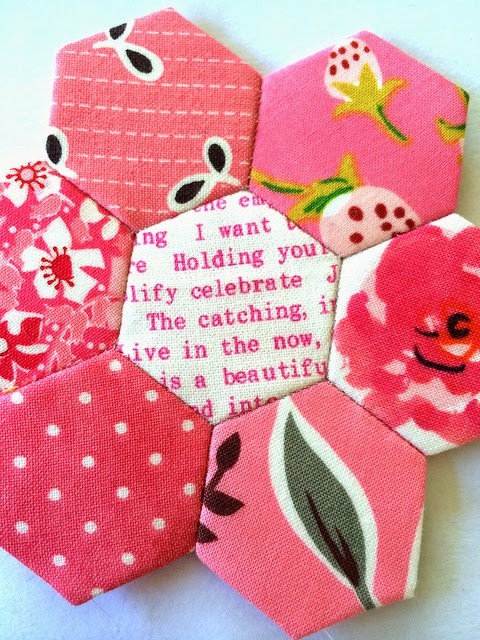 Starting with those hexies of course :) Thoughtful gift. That yarn bombing is stellar with the bee and the flower. Thank you for including it in your really interesting Blog. Congratulations on being published so well! I must get the magazine now! Your sewing room is coming along nicely - what a fabulous space it will be when you have moved in and got everything you want around you! Can't wait to see it then! Congratulations on appearing in the magazine! They couldn't have chosen anyone better. We will be back in NZ in February so I hope to see the article then. I'm sure the patchwork group I belong to has a subscription to this magazine so I'll look for it then. Or perhaps in the Library. They have an amazing variety of magazines to read and keep the back copies for several months too. Your Sewing Room is looking very exciting! Loved the cycle racks - what a cheerful addition to a mundane item of street furniture. Wow! Look at YOU! What a star you are becoming Rachael?! I love the hexie kit- the scissors are just like a little pair I have! And what fun is that yarn bombing-it always make me smile! oh girl that is awesome! yeah!!!! the yarn bombs!!! the bee! that took me right out! 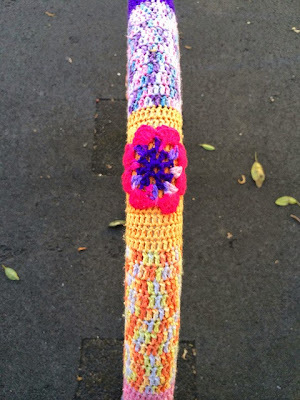 i love a yarn bomb. makes my day. excited to see your new studio with color. Congratulations on the magazine recognition! You really deserve it because you're right, your blog is a welcoming place to visit. What a nice gift from a friend! Your painting sounds like a lot of work-three coats!-but I bet you will love your bright space. Yay! Well done you!! Must get me a copy. Lovely goodies from Kelly. Congratulation on the article and the new sewing room that is coming along nicely, By the look of things you will be in there sewing up a storm before Christmas. Absolutely loved your Jacks and Jill, they brightened my day. Congrats on the magazine! That is exciting! I will have to look for it at the book store. Every once in a while I will find an Aussie magazine! Your picture is so pretty....it is so fun to see the face behind the name. Ohhhhh! How I would love to have a sewing room. How exciting! I'll have to keep my eyes out for the magazine. 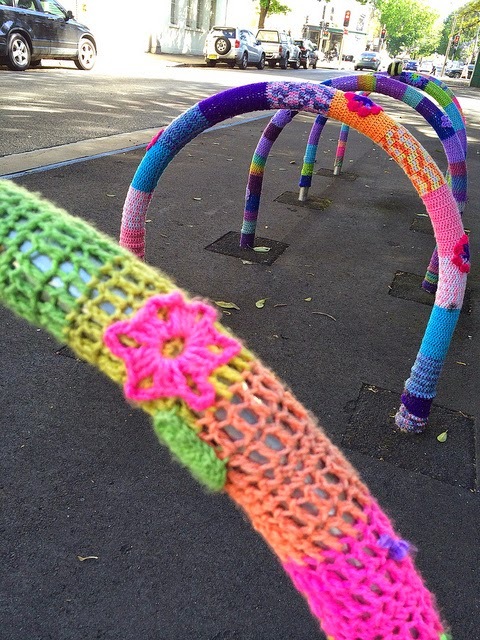 I love it when some yarn bombing is found. There were a few bits in Bathurst, but I haven't seen any lately. It always brings a smile to my face. Bring on the sewing room. You won't know yourself in that lovely bright space. Congratulations on the article, thanks for sharing the cover so I know what to look for. I had looked for this one last week but wasn't sure what I was looking for! I love a bit of yarn bombing too. My bus goes down Melbourne St in Adelaide and there must be a yarn bomber who lives or works nearby as random new works pop up regularly! Makes me smile too. That is very exciting news. Congratulations. I will look out for the mag. I am also very pleased that you are happy with the write up. That is a bonus. Lovely gifts from Kelly and very special. Good luck with your sewing room. Doesn't a lick of paint make a huge difference. Can't wait to see you settled in! Many congratulations Rachael - super exciting and very well deserved :-) Sorry I haven't commented for a while on your blog - I am just catching up reading all your wonderful entries now :-) The yarn bombing is so fun and colourful - makes me smile to look at it! Very SWEET! Your blog has been a blessing to me :) Congrats on the article recognition. How fun about the magazine! Congrats! 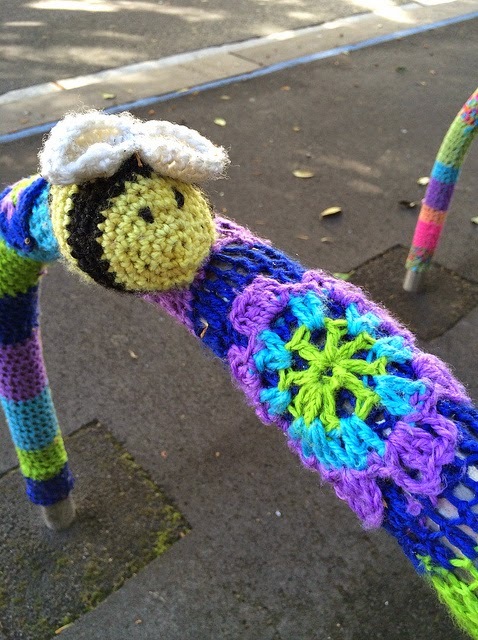 :) The yarn bombing is too fun - that bee!!! You must be looking forward so much to getting into your sewing room, all fresh and bright now. A great article Rachael...loved it! Congratulations again! Congratulations, I'll have to buy a copy. I love your blog and it really is a happy place to visit. What an exciting post. Congratulations on the article. Love the bike racks and your sewing space is going to be spectacular. 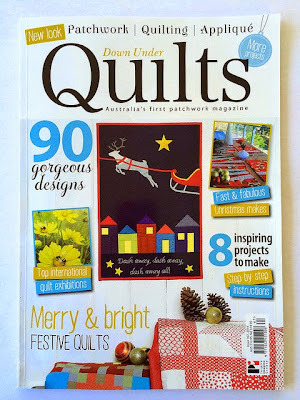 Congratulations on being the featured blogger in Down Under Quilts!Very cool. I think you do a wonderful job with your blog. There is a nice mix of fabric inspired stories mixed in with some damm fine quilts. What a wonderful gift from your friend. How lovely that each centre hexagon has the word celebrate in it. Did you get settled into your new studio? The weather wasn't exactly conducive to lots of physical activity. I stayed in the cool air con and worked on my Christmas presents.